In September 2018 The London Design Festival brings 400 events, colourful chairs and a fluorescent lion to the capital. We've listed the main events and previewed the must-see events on in London during the festival. Nine days of design events from small product launches to large scale, interactive installations. Celebrating London as the gateway to international design, the London Design Festival returns for a 16th year in 2018 with hundreds of events and exciting installations. 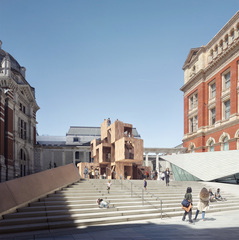 Look out for landmark projects in the city and at the V&A. Alphabet, by Kellenberger-White, brings colourful alphabet chairs to Broadgate, MultiPly is an interactive maze-like installation in The Sackler Courtyard of the V&A and everyone's invited to a tea party on the first floor of Fortnum & Mason's. A citywide event, cultural institutions like the V&A, Somerset House and the Design Museum take part and design districts create hubs in Bankside, Brompton, Clerkenwell, Fitzrovia, Marylebone, Mayfair and more. This year, for the first time, Paddington and St James's join in with an installation which reacts to light and wind over Regent Street. Events vary from product launches in tiny boutiques to massive trade shows including designjunction, Decorex, the Design Fair and 100% Design. A playful 26 letters of the alphabet fill Finsbury Avenue Square. Explore, interact, move, and make words with the alphabet chairs, popping up in Finsbury Avenue Square. The 26 bespoke colourful seats have been designed by London-based graphic design consultancy KellenbergerWhite as a landmark project of the London Design Festival at Broadgate. Each chair is a different colour from International Orange (used for San Francisco's Golden Gate Bridge) to Cornflower Blue and some - Z, R and M - are even flat enough to sit on. Discover the alphabet in front of Exchange House, built on an exposed steel bridge spanning the tracks of Liverpool Street Station. Explore a maze-like installation in The Sackler Courtyard and a special sound installation. London's venerable Victoria and Albert Museum is the central hub of The London Design Festival for the tenth time in 2018, when the festival celebrates its 16th year. This year, to tie in with the current V&A displays - Videogames: Design/Play/Disrupt and The Future Starts Here - the programme explores new technologies, sound, digital design and gaming. MultiPly puts an interactive, maze-like installation in The Sackler Courtyard which you can explore, going up and down tulipwood staircases and across bridges. Inside the museum, in Room 131A, you'll be 'dazzled' by a display which explores the experimental camouflage painted onto ships during the First World War. In the tapestries room, Henrik Vibskov's Onion Farm creates a colourful red textile tunnel structure from which 'onions' seem to grow. Design displays from 40 countries, cities and territories at Somerset House. 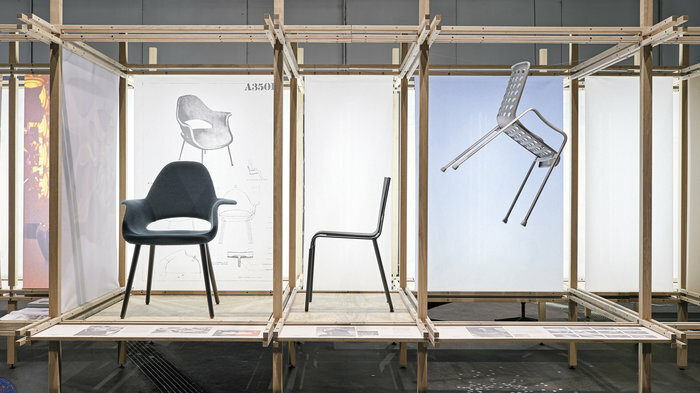 Produced by the team behind the London Design Festival, the three-week long London Design Biennale brings an international element to the design festival. Held for the first time in 2016, the biennale returns in 2018 bringing design installations and exhibitions from 40 countries, cities and territories to the heart of the capital. Exhibitors respond to this year's theme 'Emotional States' through contemporary design, their immersive presentations occupying the former royal palace at Somerset House, including the famous Edmond J. Safra Fountain Court and River Terrace. Outdoor installations include Mud Shell, an innovative housing project. For its eighth year designjunction, a key part of the London Design Festival, moves to the South Bank. The Riverside Walkway will showcase a series of outdoor installations including Mud Shell, an innovative housing project marrying ancient earth architecture techniques with drone spraying technology to transform temporary housing into permanent homes. Nearby, Oxo Tower Wharf and Bargehouse house 200 international design brands and temporary pop up shops as well as hosting product launches, installations, exhibitions, a specially curated talks programme and spaces to relax, meet, work and eat. A jetty covered by steel arches and colourful ribbon, promoting inclusion in design, looks ahead to the Saint Etienne Biennale in 2019. 500 exhibitors from 28 countries in the heart of East London. Cutting edge design at the commercial cornerstone event of The London Design Festival. Philippe Starck's prefabricated house, Tesla's solar energy storing Powerwall and Heatherwick Studio's architectural enhancements are all at this year's 100% Design, the commercial cornerstone event of The London Design Festival. It's a vast showcase for more than 400 architects, product designers and interiors specialists. Dividing the Olympia exhibition centre into areas for the workplace, interiors, emerging brands and for those working in the construction and architectural industries, the fair hosts product launches for decorative lighting, furniture and fittings as well as providing a platform for newcomers. Thomas Heatherwick, Dezeen Editor in Chief, Marcus Fairs, Kelly Hoppen and Marcel Wanders are just four of the industry experts at 'Talks with 100% Design' while Dealer Day is a chance to network and attend seminars and talks. Predominantly a trade show, doors are open to the public on the final day. A hotbed of high-end interiors. Decorex, the longest-standing design and interior show during The London Design Festival, returns to Syon Park, with Robert Adam's Syon House providing an elegant backdrop to the event. Names to look out for include A RumFellow, with its collection of textiles designed in collaboration with indigenous artisans from around the world. Another highlight is Blackpop's new fabric and wallpaper collection under license with Sir John Soane's Museum. Over 400 companies exhibit new products and collections from contemporary, traditional and bespoke furniture to the latest lighting, floor coverings, fabrics and wall coverings, accessories and bespoke services. While primarily a trade event, members of the public are able to attend the show on the penultimate day. From cheap budget accommodation to luxury 5 star suites see our discounts for hotels, including Hilton London Islington Hotel from 68% off.